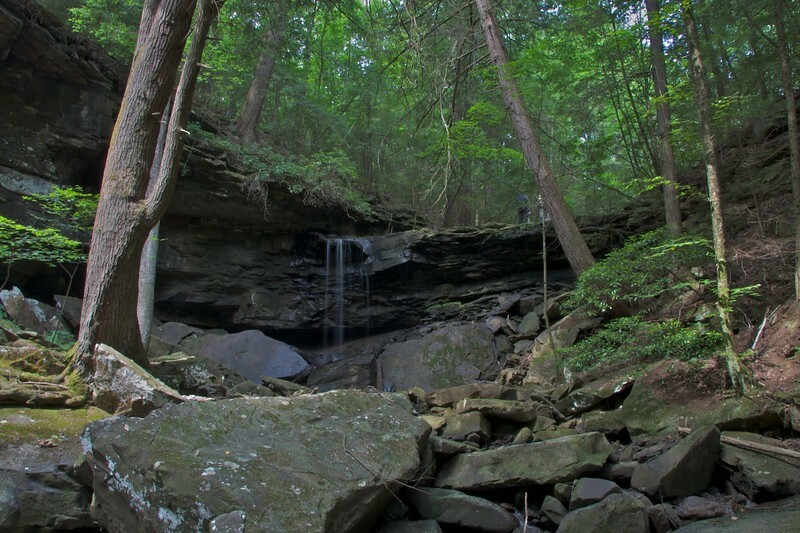 The Wednesday Group of the Smoky Mountain Hiking Club chose Polly Branch Falls in the Bridgestone/Firestone Centennial Wilderness as the destination for this day's hike. The weather forecast called for a 60% chance of thunderstorms, and we did get several episodes of rain while hiking, but it was light and short-lived each time. The water levels in the streams were very low, and the Caney Fork riverbed was bone dry in this area. But the clouds kept the temperatures pretty comfortable for the most part. However, we had not been off the trail for more than 20 minutes when we were hit by a pretty severe storm with heavy rain, hail, and strong winds, and the drive back to Knoxville was rainy all the way. Upper falls on Polly Branch. The water flow was low, so there were no spectacular falls to be seen this day.